Scrap Book is made out of white fabric with a silver metal frame in the middle. The pages are white 8"x8" - 2 sided. 20 pages total (10 sheets) are included as well as plastic sheet protectors. Also included is 2-sided tape and metallic markers. Albums are included for weddings only. 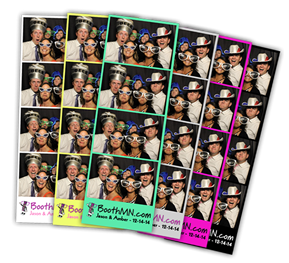 BoothMN.com offers real, fun and profesional photo booths in Mounds View, MN! We service the entire state of Minnesota. We use professional grade camera gear, printers and software for great quality pictures and results! Our Mounds View, Minnesota Photo Booth Rentals are designed to fit several guests at a time and each group can stand instead of sit on a cramped bench. 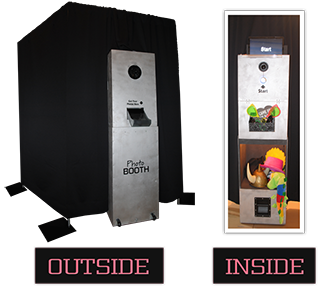 Our Mounds View, Minnesota Photo Booths are designed to allow several guests at a time and your group can comfortably stand instead of sit in a cramped bench. 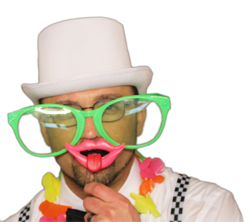 Why choose us as your Mounds View, Minnesota Photo Booth provider? We have an operator with every photo booth, so there isn't anything to worry about except having a great time! Delivery and setup is included and done by our staff. We let you choose what works best for you and your guests. You can allow your guests to have unlimited visits to the booth. You can have a copy put into a scrapbook. We can post the photo's on facebook so your guests can see and share the photo's after the event. Props are always included with no extra cost! You can even split time! Meaning you can have the booth open during social hour, close it for dinner and re-open it later in the evening. There are many options for Mounds View, Minnesota Photo Booths, be carefeul and make sure you get what you pay for! We used BoothMN for our high school's prom. They set up on-time, had nice props to use for pictures, and the attendant was very professional. The attendant was also very patient with the students who were lined up in droves to use the booth! The pictures turned out great! I highly recommend BoothMN for any photo booth needs! Service Area: We travel nearly anywhere in Minnesota and surrounding areas. Complete USB Drive of Photo's Provided: You will be given a USB drive with all of the pictures and print files after your event. Customized Photo Borders, Templates or Text Can be Applied to each Photo: A frame or border can be printed on the photos to represent the theme of the event or just a note to your guests. Posting the Photo's Online: If desired, we post all the images for you and your guests to access through this web site. 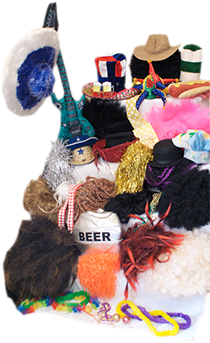 Wigs, Hats, and Other Props: Props will be provided free of charge unless you prefer not to have them. Custom Printing, Scrap Books, Albums and Graphics: We have a professional staff of Photographers and Graphic Specialists to help you with custom prints. Prints On The Spot: High quality color or black and white prints are available with every Mounds View, MN Photo Booth Rental. Try out our Professional, Fun, and Affordable Photo Booths in Mounds View, Minnesota!